Therapeutic Massage with hot stones helps facilitate relaxation. Therapeutic Massage with Hot Stones provides a space and method where people can relax and just live in the moment. Both general relaxation and muscle relaxation help create greater health. Massage is not a panacea. It doesn’t fix everything. But it can help you create space for healing within your own body. If you think that nothing is going to take away your physical pain, then nothing will. But if you think that perhaps massage could help improve the situation, then you have a good chance of improved range of motion, increased relaxation, and improved overall well-being from massage. I often find that therapeutic massage is people’s first step into wellness. Too often, we are used to giving to others and not taking time to receive care ourselves. This frequently happens when we are caregivers for others. Therapeutic massage offers an opportunity for the client to physically relax which is just too uncommon in our day-to-day lives. Years ago, my chiropractor recommended I get a massage. I was suffering with chronic headaches and pain. At first, I would get a massage when I had a headache. I appreciated the relief I got from the massage, but in between massage sessions, the pain came back. Eventually, my husband would ask me when I had gotten a massage most recently. Basically, he meant that I was starting to get a little moody and he could tell I was headed back to headaches. Eventually, I realized that regular massage kept the chronic pain at bay and makes me a happier person, in general! I encourage you to try out massage once or twice to see what impact it has on your life. If you’re in pain, you probably don’t even know how much tension you’re carrying around in your body. Most people don’t – You’re completely normal! It’s like the old story about the lobster in the hot water – When tension and stress build slowly, we don’t realize it until we’re about to get cooked! Our muscle tension builds over the course of years and becomes like little pieces of gravel in your shoulders and neck. We all have it, but it doesn’t have to be there. I find that men sometimes don’t get massage as much as they should because it seems like a bunch of girly spa stuff. But really, men should get massage because it gets rid of the knots in the shoulders and the lower back problems that make them walk around looking like they’re 40 years older than they are. Really, if you’re a man, keep reading and find the information about massage being just like car maintenance. You would never go two years without an oil change. Neither should you put off taking care of your own health. Women tend to avoid massage for a different set of reasons. First, they are way too busy taking care of other people. The first task I have is to get women to see that they deserve time to take care of themselves. The second main issue is that women can be really self-conscious about their bodies. It just seems weird to them to let someone see their back or legs. I’m not a size two. I don’t presume that anyone’s body is perfect. Being a certified massage therapy is a lot like being a doctor. I’m thinking about knots and muscles, not an extra pound here or there. Honestly, no one looks taut and toned when they are laying down relaxing. It’s not about posing. It’s about getting your muscles worked on. The strangeness of letting someone work on your muscles wears off in the first few minutes and then the appreciation of the relaxation and the physical de-stressing takes over. You will probably find yourself a convert to the whole thing very quickly. People don’t take time for themselves. We don’t think we have enough time. But people spend several hours watching t.v. each week. An hour on the massage table can give you back several hours of energy to actually enjoy your life and do something positive with your time. If you don’t make time for yourself, your body will eventually make you make time for yourself with headaches and pains. 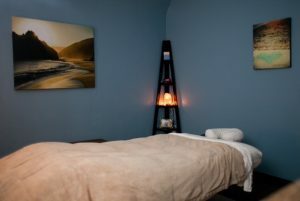 My clients report feeling re-energized and happier after massage. They say this even lasts for days sometimes. The way I look at is that massage is like car maintenance. Just because you bought a car doesn’t mean that you’re done with the car. You still have to fill it with gas, get the oil changed and take care of any weird noises or car dysfunctions. That’s how it is with massage. Many people get regular massages for optimal health – just like they would fill up with gas. Other people do it as regular preventative maintenance – just like they would get oil changes. Other people come in when things are getting bad – their chronic pain is akin to the weird noises or trouble starting that our cars may have over time. 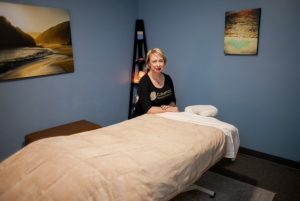 They take care of the problems, and then they usually keep coming because they find that their overall health is improved when they get regular therapeutic massage. Massage can put you in a better mood and make you a happier person all around. Give it a try – let’s see if it improves your life. If you don’t recharge your battery, you won’t have energy for anyone else. You may be afraid that taking time for yourself is selfish. But your body and your health are gifts and treasures. You would take care of any other gift that you received. You should care for your body and your emotional well being as well. When you use your body all day at work, knots and aches build up. It’s very easy to end up walking around looking like you are 40 years older than you are because of the lower back pain you have. Are you taking better care of your tools than you are of your body? How tight are your shoulders and forearms? Are you in pain at the end of the workday? If so, then you really should give massage a try. I can work out the tension you have and teach you exercises to decrease the impact of your computer time. Chronic pain is frustrating to live with for yourself and for your family. The pain wears down your serotonin level little by little until you become a cranky, moody person. You get so that you don’t enjoy living with yourself. Massage can help release your oxytocin levels so that your mood stabilizes and your body can move forward. Keys to decreasing tension and stress. Drink enough to water to flush out all the toxins. Just like your mom always told you, get a good night’s sleep! Do what you know helps you – if your doctor told you to take vitamins, then do it! Get a great new haircut! Remember that the glass really is half full. Do regular maintenance on yourself. And most importantly, JUST BREATHE!